SportsForce started the week at the San Diego All-CIF awards at the San Diego Hall of Champions, which honored top Spring athletes including some SportsForce alumni. The awards ceremony honored a series of SportsForce profiled athletes. Profiled SportsForce athletes who were honored included the following baseball players, Noah Murray an infielder from Steele Canyon, Alex Murren of Romona, a standout outfielder and Dillion Haupt of MiraMesa who was named to the second All-CIF team for his performance as catcher this season. Dillon Haupt – Baseball Recruiting Video from Sports Force on Vimeo. Softball standouts Alex Miller of West Hills and Alysha Isaacson were named to first and second All-CIF teams respectively. Miller is an outfielder and Isaacson a left-handed pitcher. Catcher Bri Austin also of West Hills and outfielders Kaitlin McGinley, Valhalla Jr. and Katie Schumacher, Scripps Ranch Jr. were named to the All-CIF second team for softball as well. Girls Lacrosse stars and SportsForce alums Alanna Parker of Monte Vista Sr, who signed a scholarship to Davidson in the fall and Sammy Slattery Carlsbad Sr. were named to the first All-CIF team. Kaitlin McGinley – OF – Softball Skills Video – 2010 – San Diego Renegades from Sports Force on Vimeo. Earlier this season SportsForce had the pleasure of filming the following CIF Players of the Year: Myles Muagututia, of Francis Park for Boys Volleyball, Zach Leslie, Point Loma for Boys Tennis, Bobby Braun of Coronado for Boys Lacrosse and Jackie Candelaria of the CIF Champion La Costa Canyon for Girls Lacrosse team. Aside from catching up with our San Diego area athletes, SportsForce was in Orange County for the Sage Hill Football Skills Camp on Saturday. SportsForce was able to get some great footage on some talented high school football players as well as conduct in depth on field interviews with some NFL players. In attendance were Kirk Morrison – Oakland Raiders – LB, Kevin O’Connell – NE Patriots – QB, Freddie Kieaho – Ind. Colts – LB, Robert Ortiz – NE Patriots – WR to name a few. We asked them about their transition from high school to college football, what the college recruiting process was like for them, what advice they have for high school athletes and more. Keep posted for a video interview to follow. SportsForce also finished working with some of the top Lacrosse Players in San Diego who are on their way to the east coast for the Nike Blue Chip Lacrosse Camp. Coming up this week SportsForce will be at the Baseball College Coaches Camp, and holding down the fort in the office testing out our soon to be launched site as well. SportsForce was at the 2009 Breitbard All-CIF awards held at the Hall of Champions in San Diego, CA June 22, 2009. Former Padres Pitcher and 1976 Cy Young Award Winner Randy Jones was the keynote speaker, and honorees had the pleasure of receiving their awards from him. Awards were given out to members of the first and second teams in baseball, softball, boys track and field, girls track and field, boys swimming, girls swimming, boys volleyball, boys tennis, boys golf, gymnastics, boys lacrosse and girls lacrosse. The “First” and “Second Team” recognition was decided by a media panel with input from coaches. The honorees came from several high schools through out the region, with no one school dominating the awards. 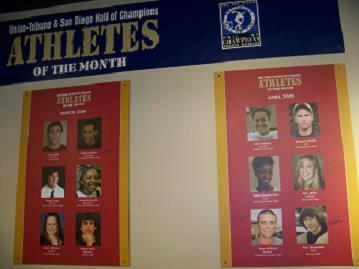 Some of the schools with top athletes were: Mission Hills, Rancho Buena Vista, Poway, Mt. Carmel, Steele Canyon, Scripps Ranch and Escondido to name a few. Player of the year honors for baseball went to Steven Packard of Mission Hills. Laura Winter of Rancho Bernardo nabbed the top honor for softball. Mac Fleet of University City was the top athlete in Boys Track and also the top athlete for the 1600M. Sammy Silva of Our Lady of Peace was the Athlete of the Year for Girls Track and the top competitor in the 1600M. Spencer Didio of Carlsbad was named the top performer in 100 Butterfly as well as the Athlete of the Year for Boys Swimming. Jessica Schmitt of Torrey Pines was named Athlete of the Year for Girls Swimming, as well as the top performer in the 200IM. Myles Muagututia of Francis Parker was honored as Player of the Year for Boys Volleyball. The top honoree for Boys Tennis was singles player Zach Leslie of Point Loma. Top finisher and Boys Golf Player of the Year was awarded to Steven Kearney of La Costa Canyon. Gymnastics Athlete of the Year and All-Around Top Competitor is Tina Wilhem of Mt. Carmel. Bobby Braun of Coronado was named the Player of the Year for Boys Lacrosse. Jackie Candelaria of La Costa Canyon took the honors for Girls Lacrosse. While most of us will be spending the next few months traveling, surfing, relaxing, and pretending to work out, there is a small, hard working group of teenagers all over the country who will be doing exactly the opposite: high school football players. Regardless of the level, football players around the country are spending their summers getting up unnecessarily early, practicing, lifting, memorizing their playbooks, training, and drinking protein shakes in preparation for their fall seasons. While spring ball is when these athletes spend time in the weight room bulking up, summer ball is when they take the time to hone their skills and build team chemistry. This is the time for coaches to teach their players the ins and outs of their playbooks, and then see who emerges on top with the right to start in the fall. SDSU Passing League 06_19_09 from Sports Force on Vimeo. In order for coaches to test their kids in game situations and in order for the players to gain valuable playing experience at their respective positions, passing league tournaments are run all over the country to satisfy that competitive need. Throughout the “off-season,” football players are put through rigorous training sessions with the expectation that by the time summer rolls around, they will be in top physical shape. Finally, come late May, they have the opportunity to show off their hard work on the field at a passing league tournament. A passing league game features all offensive and defensive players, with the exception of lineman, squaring off without pads or helmets. In this two-hand-touch, 40-minute game, crisp passes, precise route running, and lock down man defense are the keys to victory. The SportsForce Week in Review will keep you informed on what’s going on in high school and club / travel team sports this week, what events SportsForce is attending, what we are working towards, and maybe what our favorite lunch of the week was. Check in every week to catch up with the SportsForce team. SportsForce has been very busy this past week as with every week. As we expand the number of people on the SportsForce team we are powering faster towards the launch of our new site and locking down the Southern California sports market. On Tuesday, SportsForce was lucky enough to be invited to the Connect Sport Innovators Capital Forum at the HardRock Hotel in downtown San Diego. CEO Andrew Beinbrink was able to present to a room of startups and investors and share the SportsForce vision . For more info on the event and the Connect Sport Innovators visit http://www.connect.org//programs/sports-innovators/forum/ . SportsForce was at the annual SDSU high school Passing League Tournament this weekend, where the SDSU football coaching staff hosted over 30 teams. Some of the top teams in the tournament were: Oceanside High School (Oceanside, CA), Brophy Prep (Phoenix, AZ), La Quinta (Orange County, CA), La Costa Canyon (Carlsbad, CA). Look for the Justin Robinson’s recap of the event to come in a later post. SportsForce was a video production partner for the 39th annual California Baseball Coaches Association North – South Series at San Diego State University both Friday and Saturday. This three game series featured more than 40 of California’s top rising senior baseball players. With over 20 college coaches including coaches from UCLA, CAL, Fresno State, SDSU, USD, Long Beach State and about 10 Major League scouts in attendance the competition was strong. Over the years, more than 100 participants in the showcase have reached the major leagues. For more info on the event visit http://www.eteamz.com/cbca/ . The North-South Series was played at San Diego State University on June 20 and 21. A doubleheader was held on Saturday and a single game on Sunday morning. The showcase is run by experienced high school coaches who have done this for over 20 years. There is no cost to the players other than bringing two baseballs with them to be used during the workout sessions. Players have been observed by over 100 pro and college scouts during these workouts. SportsForce was at the MaxPreps Summer Series Basketball tournament. Following our blog on summer camps, the series shows there are many options to develop your game over the summer. The action was quick and talent great with many great Southern California club teams. Over 15 club teams participated in the two-day tournament. Lots of action this past weekend and more in the coming week. There is no off-season for SportsForce! 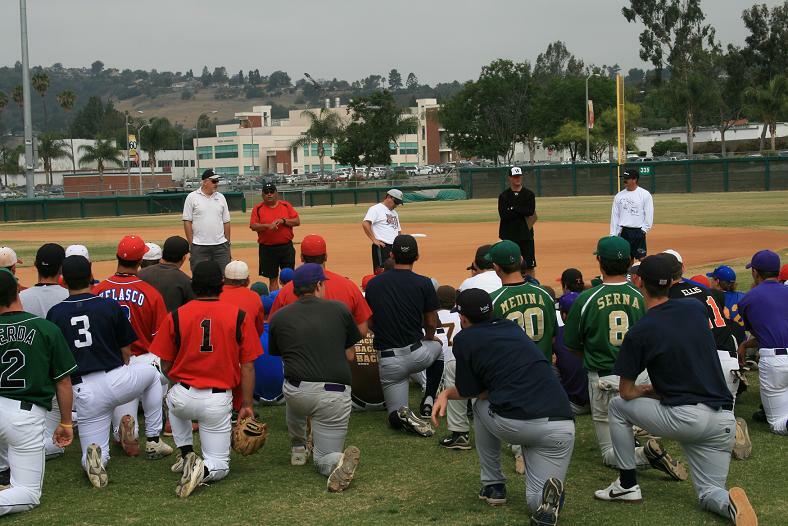 Coming up this week is the Baseball National Prospects Camp and the Cal Cup. One of the most important steps towards becoming a student-athlete at the college level is confirming your athletic eligibility with the NCAA. The process can be somewhat confusing, but the NCAA is taking steps to make it as pain free as possible. The NCAA Eligibility center is unveiling a new website that hopes to make the eligibility registration process as easier. The site aims to aid coaches in accessing important information on student-athletes in order to help them with the amateurism certification process and academic registration. The site also hopes to offer a more interactive and inviting atmosphere for student-athletes and their parents. The site will be launching on June 29th, 2009 and be accessible for student-athletes hoping to register and certify their amateur status for the 2010 season. The new site is www.NCAAstudent.org. With the 2009 NCAA College World Series in full swing, it’s time to take a look at where some of the key players from each team came from and what paths they took to get to college baseball. All of the players listed are their team’s top pitchers and hitters statistically. P Mike Leake – Leake attended Fallbrook High School in suburban San Diego. Leake quickly garnered the attention of local coaches and scouts, making the varsity team his freshman year and contributing immediately. Leake eventually would be named first team All-State in both his junior and senior seasons and was named the number 11 prospect in the west by TeamOneBaseball.com. Leake also garnered national attention when his summer ball team, the San Diego Sharks, won the 2003 USA baseball tournament. Leake was drafted out of high school in the 7th round of the 2006 draft by Oakland, but elected to attend ASU instead, where he became one of the premier pitchers in ASU history and set numerous Pac-10 records as well. He was picked 8th overall by the Cincinnati Reds in the 2009 draft. OF Jason Kipnis – Kipnis attended Glenbrook North High School in Joliet, Illinois, where he played baseball and football and earned All-Conference honors in both sports. Kipnis was also named All-State in baseball his senior year. Kipnis went to Kentucky his freshman year before transferring to ASU for his sophomore season. Kipnis was drafted by the Padres in the 4th round in 2008, but elected to return to school. Kipnis was selected in the 2nd round by the Indians in the 2009 draft. He was not drafted out of high school. 1B Andy Wilkins – Wilkins attended Broken Arrow High School in Oklahoma, where he was a two-time Louisville Slugger High School All-American and two-time All-State selection. Baseball America ranked Wilkins the number 11 prospect in the state of Oklahoma, despite his numbers being worthy of a number one ranking. Wilkins was selected out of high school in the 25th round by the Texas Rangers in 2007. He will be eligible to be selected in 2010 out of college. P Dallas Keuchel – Keuchel attended Bishop Kelly High School in Oklahoma where he won two state championships and was twice named pitcher of the year. A three year started, Keuchel was also the quarterback of the football team, where he was named an All 5A East Region selection. Despite his accomplishments, Keuchel was not drafted out of high school. Keuchel became the ace of the Arkansas staff and was drafted by the Houston Astros in the 7th round of the 2009 draft. School’s out for the summer (or almost is)! Now it is time to redirect your focus to life beyond high school (yes, there is life past high school). But for athletes who are aspiring to play a sport in college, summer is no snooze. It is time to work hard, get seen and see schools. So what do you need to do and when do you need to do it? That what I am here to share. So you just survived your first and second year of high school (phew) and the thoughts of college are beginning to creep into your head. Where do I want to go? What do I want to study? What classes do I need to get into certain schools? As all of this can be somewhat overwhelming, let’s just focus on one aspect at a time. This is the best time to really get around and see campuses. Because as you all know from my first blog, really loving the school you go to, regardless of sports, is very important. So if you are traveling around to play in tournaments, go on vacation, or visiting family and friends, take advantage of the travels to go see the local colleges to check out the campus and area. While there you can take a campus tour and if you have given a heads up to the coach of your sport, you can even go in and meet with them. Remember, they cannot call you or contact you in any way, but you can call whenever you want. Set up a time to meet with them and they might even take you around the campus themselves! This elimination period will be helpful as you enter your junior summer as that is the time when you need to really narrow down your schools and begin to target your goals. By seeing the campuses alone, you will be able to eliminate many schools, thus leaving you with a more reasonable list to deal with. Summer camps are also very important. While all of your friends are going to Camp Nowhere for fun and kayaking, you need to be going to sports camps for a school that you are strongly interested in. Not only will five days of camp help improve your skills, but it will give you the most intimate interaction with the college coaches and some of the current players, as they tend to work camps. You will live on campus, interact with and be trained by the coaches, as well as be a part of high intensity competition. It is not only a great way to get to know their style of coaching, but for them to get to know you as a player and whether you will fit in with their program, and vice versa. 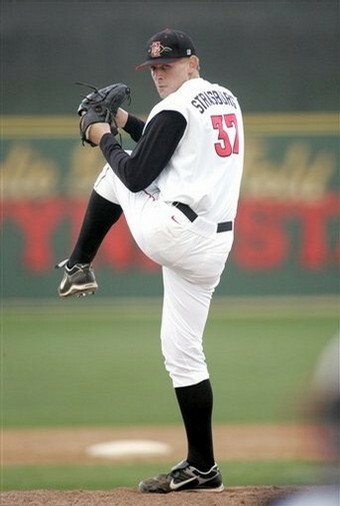 Not many people were surprised when Stephen Strasburg was selected as this year’s number one MLB Draft pick. Strasburg went to the Nationals and so ended the discussion and hearsay of where he might end up. Strasburg, the 22-year-old pitcher from San Diego State University, has already become somewhat of a legend with stories of a 100 mph+ fastball, 90 mph slider, and Major League ready composure. But, like most legends there is much about the Stephen Strasburg story that isn’t covered by most media outlets. It is important for fans, scouts and reporters alike to go beyond the legend and learn more about Strasburg. Luckily enough, SportsForce has been able to document some of his season and has a straight forward and simple scouting report to share on the soon to be first round selection. Being headquartered in San Diego, we have seen Strasburg a number of times and agree he is a truly dominating pitcher. Strasburg’s stuff is very impressive and would fool even some of the Major League’s most seasoned hitters, but contrary to what others have reported, Strasburg is not a four-pitch pitcher. Nor does he feature a 90-mile per hour slider. Rather, Strasburg is a developing pitcher who has two dominant pitches with room for improvement. This is partially what excites Major League teams since today’s game is being built more and more around developing pitching at the minor league level. Strasburg has the potential to be a #1 starter that can carry a team similar to a Roy Halladay, Brandon Webb, Jake Peavy or Johan Santana. However, he must first overcome a few obstacles. Stephen Strasburg Scouting Video vs. UC Davis April 4th, 2009 from Sports Force on Vimeo. Strasburg relies primarily on two pitches: his explosive 95+ mile per hour fastball, which has been clocked as high as 103, and his sharp downward biting curveball. The fastball overpowers hitters and can be located to both sides of the plate. At this point, Strasburg is not a pitcher who locates his fastball consistently every time, but what he lacks in precision he makes up for in conviction and confidence. His curve ranges from the low to mid 80’s (mph) and can be thrown for strikes in almost any count ,which is rare for a young pitcher. When his curve is used in conjunction with the fastball, he often makes hitters uncomfortable and leaves them guessing what’s next.